Did FE YouTuber Unwittingly Provide RE Evidence? analysis showing why scales don't correspond. Bottom line folks, the mountain should not be visible, but not only do we see it, it's visible at the correct angular elevation! Welcome, JT. Appreciate you following the link and joining the discussion. I'm a systems engineer with practical experience in military applications of airborne early warning radar, communications/data links, and electronic warfare. I currently work on a satcom program. It's late for me so I'm just going to pick out the item you bolded for now and ask how you calculated that San Jacinto's summit of 10,800' 117 miles away should not be visible from an elevation of 150', given a 450' obstruction 19.9 miles away and given an earth curvature of radius 3959 miles. Straight geometry, without accounting for a refractive atmosphere, I calculated 1455' of summit visibility. I'd like to know how you came up with your result. Next morning edit: having read your posts more careful, don't feel you need to answer this since I think I understand your technique. I consider it flawed, but I'll wait to see if you affirm my re-stating of it. Next morning edit: Again, you can ignore this since you address it in one of your follow-on graphics, showing about a 2600-2800' elevation rise is visible. Your premise is that San Jacinto should not be visible at all if the earth is convex. I disagree, but even if so, why does seeing 2500' vice 9000' favor a flat earth rather than a convex earth? Being able to see more with an atmosphere than would be predicted in an atmosphere-less calculation doesn't render the conclusion that the earth is flat. The earth could be less convex than the geometric calculation using a greater radius input, but convex nonetheless. The method of accounting for standard atmospheric refraction is done by that very means, "flattening" the level of convexity by an indexed amount such that the earth looks a little less spherical than it actually is. But it's still far from what a flat earth would predict. Similar to Tom here (and on other discussion threads here), I see you citing atmospheric refraction when it favors a flat earth observation but ignoring it when assessing curved earth RF/light propagation. As a fellow radar engineer, I find that to be curious; biasing, actually. Next morning edit: Having read your full post I now see you have rather radically different understanding on standard refraction and anomalous propagation of light, which I find curious given both of our claimed backgrounds. If you're willing to stick around, this may be the crux of a continuing discussion. I'll try to describe what you're saying with this to see if I have it correct. You deduced that the difference in elevation between San Jacinto summit and Saddle Junction was about 2600'. At 117 miles, a rise of 2600' produces angle of about 0.004 radians (0.23°). Saddle Junction is in-line with the ridge line in the foreground, which would make the vertical angular displacement between that ridge and San Jacinto summit 0.004 radians. So far, I'm in close agreement. I estimated 2500' of visible elevation of San Jacinto and the scale I annotated on your image shows that vertical displacement to be about 4 miillradians too. You feel that your angular gauge, based on vertical estimates of the Le Meridien Defina, is correct and thus this vertical stretching of the distant landscape is not contradicted by your scale. Did I capture that correctly? I redid the graphic I had in my video, to clearly show the foreground hills blocking the view of the mountain, in case that wasn't clear in my video. I did say the hills across the water would be blocking it. And this updated graphic: how did you derive the 10 milliradian angle that the foreground hills would produce above the line tangent to a curved earth surface. It looks like that is based off of your angular gauge as well, measured from where you placed its origin: at the shoreline of Santa Monica beach. Is that correct? If so, then it hinges on the accuracy of the gauge based on the Le Meridien Delfina as well. Yes? You may relate to this: I analyzed data from radar warning receiver payloads a while back and that's when we noticed detections out to twice the distance to horizon calculated from our altitude, then one day a mind blowing 5x to 6x the distance. Highly Anomalous all right, almost out to 1500 miles if my memory serves me right. Simply astounding! I feel like RWRs are the best tools for flat earth research, because the signals only incur a 2 way path loss, so high power radar sets out in the distance can be picked up at incredible distances. After that a fellow engineer sent me a paper from Sandia Labs written by Armin W Doerry that is excellent at highlighting our confusion, the first sentence in the abstract caught my attention. see image and link below: I thought, somebody knows something here, just like I do! That's when I realized what were doing wrong as scientists, physicists, engineers, and mathematicians, nobody in their right mind would say the earth is flat, we settled that long ago, so we assume it must be curved electromagnetic wave propagation, so we create elaborate mathematical models and curve fit to the observed data. But wait a second, what if that is a wrong assumption? Just because we can curve fit to some concocted mathematical model, it doesn't make our model's assumptions necessarily correct. I can assume a different curvature and a different model and curve fit data just fine. anyway, getting back to the infrared images, it appears after a few reviews you're now understanding my analysis images and what I'm saying. Keep pondering and thinking and it will become even more obvious. My understanding of atmospheric refraction might seem "curious" to you at first, but it's right there in the image, starring us in the face. I relate to it, but in quite a different way from you, apparently. 20-25 years ago, we were not only NOT astounded by greatly extended detection ranges of UHF long range airborne surveillance radar, but knew why it occurred and devised ways to exploit it to our advantage. Same with our passive detection systems (akin to RWR), we could use atmospheric conditions to our advantage that negated the limits that would otherwise be imposed by earth curvature. I actually find it perplexing that you would lean away from orthodoxy and toward a flat earth model on account of this kind of extended range phenomenon. It's not a mystery. What's still a challenge (apparently, by virtue of the paper you attached having a date of 2013) is finding better and improved ways to model and predict the conditions of a dynamic atmosphere for the purposes of designing and employing such systems to their optimum. But you're the first person I've ever encountered who has experience with such systems who would give credence to the notion that the earth is not of the radius we think we know and that such anomalies are of such an astounding nature as to consider that the earth surface may, in fact, be flat and not convex. But anyway, back to your IR imagery, though I apprehend your analysis, I'm still confused by it. It seems your starting point for geometric calculations is the gauging of the le Meridien Delfina. It'd odd to me that you would base the rest of your angular calculations based solely on that one datum. The 10 milliradian angle you predict should be formed by the foreground hills is based on the accuracy of that, but it doesn't match with observation. It doesn't match with the topographical data on the elevation of those hills. Your gauge doesn't match with the known height of the nearby Pacific Plaza. It doesn't match with where eye level should be assuming a flat earth. And it certainly doesn't match with the visible amount of San Jacinto, which you've reasoned is just an apparent discrepancy due to assumed sub-refractive atmospheric conditions. So my hat's off to you for facing up to the critique. And I do believe I am following what you are saying in defense of your analysis. I just think you are analyzing it through a lens that is expecting to find a flat earth (maybe?) In your video, when you grandly exclaim "behold, your flat earth" as the San Jacinto mountain range comes into IR view through the typical southern california surface haze, I was thinking "that's not a flat earth! He's showing us what a curved earth surface looks like." It's frustrating to me to continually see flat earth advocates use a no-atmosphere calculation of earth curvature, identify that it does not match an observation and conclude, therefore, that the globe is busted and the earth flat. That is not logical. I hope this isn't coming off as a rant. I'm swerving around the point since we're kind of introducing ourselves to each other. I'll try to stay focused here on the topic of the analysis of your video. I think the answer is "yes." The reason it seems why you claim none of Mount San Jacinto should be visible from Malibu Bluffs on a spherical earth is because you've concluded that those foreground hills form an obstructing angle of 10 mrad (0.57°); a value which it appears you derived from gauging angular dimensions in the imagery of hotel Le Meridien Delfina in San Monica. Is that a sensible basis on which to form such a presupposition? Straight red line EL is the level eye sight from P, parallel to G.
Straight red line SL is the sight line, angled from P to the top of O.
Θ is the measure of that angle. P, O and T are all defined the same but they no longer parallel. They are tilted away from each other. Earth ground surface G is no longer a straight line but is curved. It still represents sea level. Red Line EL is still straight and perpendicular to a vertical line at P, but it is not parallel to G as it was for flat earth. There is a new essential line and point that are not applicable for flat earth. Straight blue line TL drawn from P that is tangent to G at point H (horizon). This forms an angle that's not part of the flat earth diagram. Alpha (α) is the "dip" angle between tangent line TL and eye level line EL. On a flat earth, there is no "dip" angle and what is perceived as a horizon is believed to be coincident with eye level. Straight yellow line SL is defined as it was for flat earth, but the angle theta (Θ) is not formed by it and Eye level line EL but rather with tangent line TL. 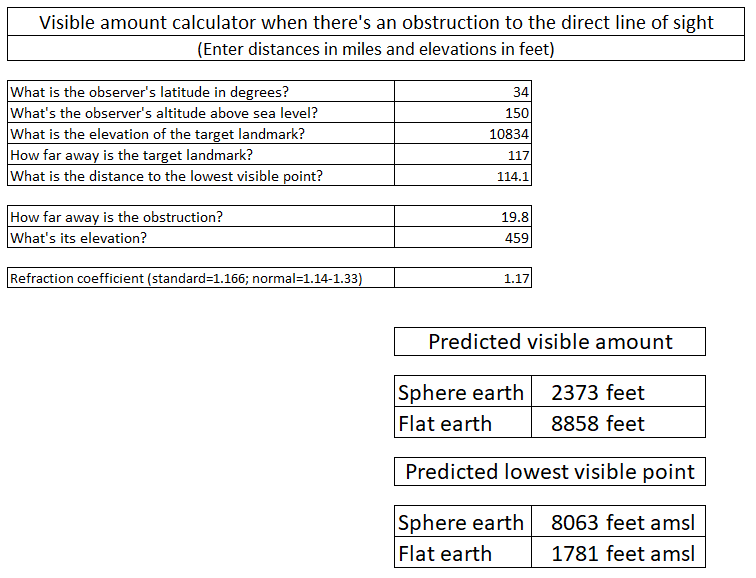 Assuming there are no other limiting obstacles and ignoring for now atmospheric effects, we can plug in known values for elevations and distances to calculate the angles and the amount of T that is obscured by O in both flat and spherical earth configurations. Your angular gauge needs to be reconciled with the vertical elevations of other features (Baldwin Hills, Pacific Plaza) before it can be used to declare what should or shouldn't be visible over a spherical earth topography. When I did this previously, I came up with 1450' of San Jacinto that should be visible even without atmospheric refraction. Doing the math now that number is reduced to 1308'. I don't know why the difference. If I find my earlier notes, I'll try to find the source. I may have simply used different values for some of the parameters or rounded differently. Or maybe I've made an error here. Whatever the reason, the Baldwin Hills do not rise high enough to obstruct the view of San Jacinto from Malibu if the earth is curved. In fact, if the earth is flat, much more of San Jacinto should be visible than the 2500-2600' that appears in the captured images. The curved earth geometric calculation is closer to what is observed than the flat earth calculation. Of course, atmosphere (atmoplane) plays a significant role in that. The question is, does it make more of the mountain range appear or less? If light is being refracted downward, then it should be more, as is the case if the earth is spherical. If light is being refracted upward as you say, then it should be less. Re: Did FE YouTuber Unwittingly Provide RE Evidence? If you return to read this topic, here's another question about your video. At the 2:15 mark, you present a slide from some excursion you took to the Salton Sea where you presented a case for seeing a 130' cell phone tower from a distance of 17 miles across the sea with a camera height of 6'. Is there more to this? I couldn't find anything in your other videos, but this is a pretty extraordinary claim. I'd like to examine it more. Can you provide any additional detail? Tower location? Sighting location? It's not too difficult to verify these figures: the main thing was creating a calculator that takes the obscuring ridge into account. Now I'll check the thread and see how my calculations match up with what others have done. It was determined that on a Round Earth the amount of mountain that should have been visible to the observer was somewhere between 7.8% to 13% of the mountain, depending on how the math was done. Not sure how you calculated those figures, Tom. My calculator returns 21.9% of the mountain predicted as visible on a sphere earth. Meanwhile, on the flat earth, it would 74.6-83.8%. Actual amount visible I make to be around 21.2%. That's around 1200-1350' more than predicted by the no-refraction globe earth calculation. But it's 6000-6250 less than was a flat earth predicts. For what its worth, WP gives a complex formula for terrestrial atmospheric refraction, but also gives a simplified ballpark of one degree for every 932 miles. For 117 miles away, the mountain would appear 1446 feet higher than it really is. That brings your calculations to within a couple hundred feet, or about 2% of total height - not too shabby. The sphere earth predictions are very close to that which was actually observed. The flat earth predictions are more than 300% wrong.